In my last post I talked about embracing the aging process. If you missed that you can read about it here. One of the things I have noticed about myself and about other women I have talked to is that as we age our values shift. I can remember a time when material things mattered so much more to me. When I was much more house proud. When I thought I needed the newest car. When I felt I had to keep up. Today, my values have changed. Today I value things like sincerity, honesty, friendship, and the love of family. I value peace and serenity in my life. As we age I believe we settle into ourselves more. That we need less external stimuli. 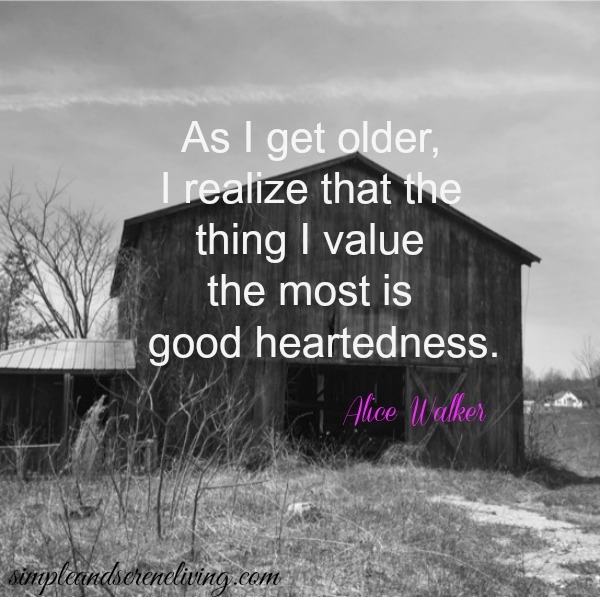 Have you felt your values shift as you age? If so, how has this affected the way that you live? P.S. You may have noticed that my posts have been more sporadic lately, and that they are somewhat shorter in length. There are some major issues affecting me and my family right now so I will not be posting as often for the time being. Also, I hope that you will forgive me for not visiting and commenting as often. I value each and every one of you. Don't worry about commenting on blogs, Laura. Every one of us needs some time off sometimes. I've noticed that I value honesty even more than I did before. wish you well, as you deal with your major issues. Great post Laura! I have found my priorities have changed as I age. I'm a better me for sure. I hope things work out for your family soon. Sending hugs! Yes, I know my values have changed the older I get and I don't mind a bit. :) I'm sorry you are going through a rough time right now and hope all will be well soon. Don't worry about visiting. We have all been 'there'. Blessings. Yes, I agree with you about this. I think part of it is that I've already acquired so much that I need less! i'm much more selective now with the material things that I buy. I go for quality over quantity now. I hope that things get better for you in your personal life. Sorry that life is hard right now. Laura, you always speak to our hearts...this post is another truth. I value honesty, friendship, love, kindness more than I would ever have even before. I hope that things improve in your life and soon. Sending good thoughts. Good Morning Laura. I think family and friendships are the most valueable things to have in life. As I get older too I feel that my relationships are what are the most important. Our purpose here in this journey of life. Not what we can buy or have but how our lives touch others. Love this post Laura. I am sorry you are having some struggles. Sending good wishes for better days ahead. Most definitely, Laura. Not only have my values changed, but even the way I look at life, death, religion and spirituality. I think this is not only due to growing older, but since my son passed away, too (6 years ago). Don't worry about lengthy posts or even keeping up with them and visiting other blogs...the issues you are facing with your family right now are what's most important. I value honesty and kindness more than ever. Hope your family issues are improving and that you know we are thinking of you and wishing you all the best! Yes, this is true, I feel as though I have gone through some metamorphosis. I just want peace and kindness to surround my family, friends and myself. Thinking of you and sending comforting and gentle thoughts your way.